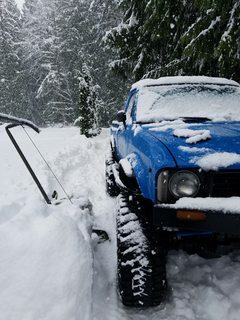 Topic: Toyodaaddict's 1980 Toyota "The Blue Truck"
Re: Toyodaaddict's 1980 Toyota "The Blue Truck"
I will say that it makes me feel better knowing I'm not the only one running higher temps. I still don't think 200+ is ideal for a 22re though. I've been daily driving a 22R (stock engine/radiator) for almost 10 years. It runs a constant 180-185. A couple years after I got it I blew a head gasket. I new something was wrong when the temp hit 190, sure enough blown head gasket. The temp is always so consistent that I new right away something was up when it hit 190. Ted at Engnbldr says "190-200 is normal for a 22re, above 215 is dangerous." LC Engineering told me "205+ is head gasket territory". Jerry at 22reperformance said "190-192 is the safe range"
Plenty of people on this forum saying their 22re's run between 180-190 under all conditions. Ok awesome good to know! 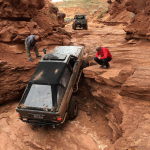 Was the weather hot in Moab the whole time you were there? This is the walk way out the back door. 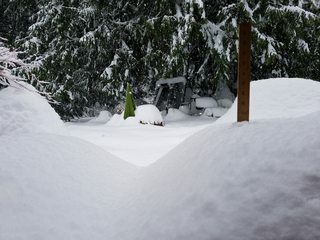 26" and still coming down hard in Hobart WA. I'm just grateful it wasn't worse. The tent had a metal tube frame. one of the tubes landed on the sun roof and crushed the roof in a couple inches, where the tube hit it. I can't believe the sunroof and windshield didn't break. 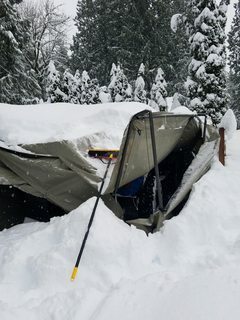 A lot of the damage to the roof popped out when I got the tent off. Hopefully I will have some luck popping out the rest. I remember hearing somewhere that you can use boiling water to pop dents. I have my doubts but I may give that a try when the weather warms up. Any interest in coming with us to Tahuya on Feb 23rd? I've never been to Tahuya. Unfortunately I cant make this one. Hopefully I can make a run with you guys in the spring. 91 toyota truck bed petaluma ca almost perfect condition red, $175 "NEW PRICE"
82 Very Slow Buildup dubbed "Ol Blue"
Project : "GOOD OLD BLUE"
Started by TURBO Stolen Rigs and Theft! !